Well, I have seen THE WAR LOVER, Alexander, and look forward to reading and responding to this later today. It looks great though. Where do you find these? I would have passed this up as just another war movie. I think I want to see this film. Terrific, Sam. I look forward to your response later. MC, not to sound like a broken record, but I recorded this one off of Turner Classic Movies. Quite a while back, actually. Just watched it very recently, though. I still have you on hold Alexander, but no matter what the 'taskmaster' Allan Fish does to pull me away from the computer, I will have a thorough response to this excellent piece before this weekend expires. This work deserves that much, and I simply refuse to place a comment until I have read every word and am prepared. I am going now to see the HD broadcast of the Met's opera THAIS (Massenet) at our Edgewater multiplex, and then tonite, Aronofsky's THE WRESTLER. I will be talking about THE WAR LOVER soon, you have a great weekend yourself, and look forward to hearing how it was spent. No problem, Sam. I'll be away from the Internet most of this weekend, and it sounds like you have a full weekened yourself. Moses, haha, that is funny about me taking over your life. I promise it is not intentional. (Or maybe it is. Bwahaha.) Thanks for so speedily seeking this out, and reading the piece, and thanks so much for the very kind words. 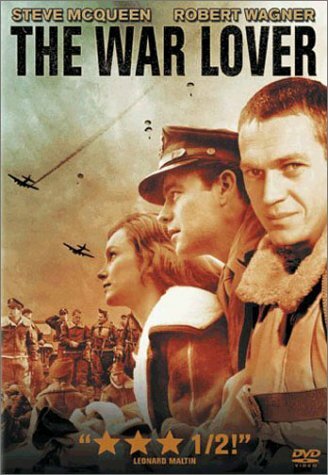 This is definitely a "different" film--and one reason I selected that DVD cover as the picture for it was because looking at it, you would not be expecting the intense, psychologically rich character study provided with The War Lover. Brilliant review. I saw this many moons ago. I agree with all of your points including the homage the movie pays to the many Hollywood flicks about similar scenarios in the previous decades. Great performance by McQueen too. I need to see this now...so I can read ALL of your review! I saw THE WAR LOVER years ago, and your review challenged me to acute recollection. Your meticulously observant review managed to bring back the memories I sought. As always your "book-ends" were impressive--a descriptive and animated opening that made you see, hear,and smell the action--and that exquisitely composed and provocative closing paragraph. I do remember Mr. MacQueen towering over every filmic element (much like George C. scott's performance in PATTON drawfed everything and anything around him); nonetheless I do agree with you when you say "the film would have worked" though even without him. Again, your authoritative grasp of film history (simply remarkable for a 23 year-old) serves your cogent thesis quite well. Likewise, your eclectic habit of posting on films many have not seen or remembered keeps things fresh and original here at CCC. Thank you very much for the extremely kind words, Sam, and I am most happy to hear that this review enabled you in remembering this film. McQueen truly is at the top of his game in this film, playing an unsympathetic but entirely engaging central character. Thank you again for the kind words and thorough comment. Absolutely brilliant movie. Steve McQueen was riveting. Thank you so much for pointing me in the direction of this very interesting film. You're most welcome, mc, and thank you for seeking it out; thank you sincerely for the very warm comment. so yer saying Steve McQueen could really act? That is what I am saying, d.b.m. He wasn't Olivier but the man could act. And he summoned an entirely singular onscreen presence, the likes of which we have yet to see since his passing. I hope you see The War Lover. It's not as famous as some of the titles we usually associate with McQueen, but it's very much worth viewing. The scene with him before all the photos is something else. But then, every scene with McQueen here is an unusual gem. Great review Alexander. Thank you so much, Christian. McQueen rules this part. So much so that you understand why Robert Wagner's character can't stop bringing "Buzz" up to his girlfriend. I love Steve McQueen and I love this movie. Never read a review of it before but I think you covered all the bases and then some with this. Nice.